I’m a huge fan of Nick Hornby's books. I’ve read High Fidelity in my college days and was completely taken by it. Hornby is known for humour, and this one was no different. This book was primarily about music, and the happenings in the life of the protagonist. But the one part that I remember distinctly is that, the hero had a habit of making a top five list for every little things. For instance, he will make a list of top 5 favourite movies, top 5 Favourite dialogues, top 5 sad songs.etc. So, after reading the book I also started doing the same. But like most thing, this lame habit of mine got lost with time. And, thankfully it did. Though I’ve never been quite good at listing my favourites, coz after reaching the top 3, I start floundering. List or no list. I love music. Starting from Begum Akhtar to Pink Floyd, I have heard them all. Though, I don’t claim to be an expert in the genre, but I’ve a decent idea about few of the ones I like. So when I listened to “Mathura Nagarpati” from Raincoat for the 1st time, it blew me away. The lyricist of this song is Rituporno Ghosh, a much acclaimed director, actor, trans-drsser and what not. So, when I came to know 6 years back, that he wrote the lyrics in brij bhasha, I was surprised. And I am still very much besotted to this number. The song is written from the point of view of one of Lord Krishna’s wife, she is sadly observing the changes in Lord Krishna, who is the King of Mathura, desperate to leave the place to visit his childhood place, Gokul, to meet his sweetheart Radha. The song questions Krishna's reasoning for doing such an act. And the wife’s struggle, sorrow in knowing that he’ll return to Radha without a backward glance. Here’s the English translation of the song I found on the net. Why are you playing the flute again? I've always been inspired by Nick Hornby's books. Was highly inspired by High Fidelity in my college days. The book was about this guy, his pals, his exs, and his love for music. But the most hilarious part that I remember was, that, he'd a habit of making a top five list for every little things, for e.g, Top Five Favourite Movies, Top Five Favourite Dialogues etc. I've been trying to make a habit of doing something similar for sometimes, but never managed to do so, as I start floundering by the time I reach top 3, evidently this hobby was never my cup of tea. But as far as music is concerned, it is extremely important for me, very much like that chap from the book. I love to sing, though I am no great shakes there and I love varied music, starting from Begum Akhtar to Pink Floyd. And I pretend not to cry when I hear something really nice (a habit that runs in my blood, courtesy my Mum & Sister). The whole point of blogging today from office at 4 pm, is that I've to write about this very nice song, that came out almost 6 years ago and I am still obsessing over it, it's "Mathura Nagarpati" from OST Raincoat, this acclaimed song is written by Rituporno Ghosh, a Bengali director, who dresses weirdly, and have been flaunting his acting talent lately, might I add, he did a fantastic job in writing this song. The song is written in Brij Bhasha, and it talks about Lord Krishna leaving Mathura, where he's the king and going back to his childhood place, Gokul, leaving his Kingdom, his crown, his wife, to meet his beloved Radha. The song questions Krishna's reasoning for doing such an act. This is written from the point of view of one of his wife, while witnessing the change in him, knowing that he cannot be stopped and will return eventually to Radha without a backward glance, while she will be left behind. This is such a heart wrenching depiction, isn't it? P.S. Hear it first thing in the morning. This song creates longing and a sad, poignant pain. I am stuck in bed nowadays courtesy my knee who couldn't handle a small scratch, resulting in my confinement to bed with my knee bandaged. Hubby dearest is having a gala time teasing me about my limp. Neways but that gave me a chance to be idle tusser all over again , & I am busy browsing anything I can lay my hands on be it books, films, net, TV. But the reason for my being here is that I again saw "As Good as it Gets" & I've fallen in love all over again with it. What I am wondering about is how one rate a movie. Some times it's the director who takes the credit , some times the story, it could be anything. But my reason for liking this one is Mr Nicholson, I absolutely adore the man and probably for all the wrong reasons. I like him for his leering sarcasm, his cynical laughter, his most uncanny sense of humor, his habit of mouthing most unconventionally rude and obscene dialogue with elan. How many of us can repeatedly offend someone & still be liked by all. That man sparkles talking vulgar & to me that makes him even more devilishly cuddly. My reason for liking Melvin Udall is Jack Nicholson not his OCD. 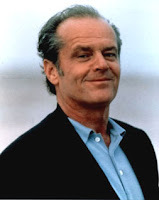 My reason for liking "As Good As It Gets" is Mr Nicholson uncanny way of talking and what inputs he add to the character.